Rubble Town was as awful as Talia remembered. She didn’t mind the heaps of gears and broken pistons, the crowded streets where scavengers traded their findings, or the smells of sweat and engine oil. But the sounds of hammering and scraping, along with voices loud enough to be heard over them, were driving her insane after just one afternoon. At least they didn’t have to head into The Anvil, where the real industry was. That would make her head explode like a ripe corpse in the sunshine. “I thought you’d have a lead by now,” Umberto Pollyglog said. The fat accountant’s face was running with sweat, the collar of the cloak that hid his uniform dark with it. They approached a tavern made out of old airship gondolas. Gas lamps glowed in the twilight gloom. “You think Shofflekrep is here?” Pollyglog asked. Heads turned as the door swung open. Two dozen pairs of eyes surveyed them with suspicion. Talia pulled a fistful of worn copper coins from her pocket and dropped them on the bar. “Two ales,” she said, doing her best to mask her aristocratic accent. The barmaid, a square-jawed woman with pox scars, started pouring. “Ain’t seen you here before,” she said. She nodded at a lean-faced man in the corner. “Make it three ales,” Talia said, handing over more coins. A minute later, she was sitting at Tolliver’s table, sliding a tankard across to him. “We want to learn.” Talia gestured at Pollyglog, who was stifling a grimace at his drink. Talia placed a jangling pouch on the table. “Fees for our whole factory,” she said. Tolliver weighed it in his hand. He pocketed the pouch and slid out the door. Half an hour later, they were still waiting. “He’s not coming back, is he?” Pollyglog said. “No,” Talia said, grinding her teeth in annoyance. She squeezed his arm so hard he whimpered. As if on queue, a man at a far table made for the door. Staying as far back as she could, she followed the man out. He and his friends had been talking about an upcoming rally. They’d talked quietly enough that no normal person could have heard, but Talia was no normal person. Now he was going to a planning meeting. 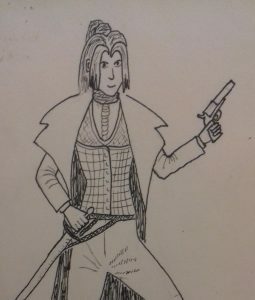 She followed him down narrow alleys, sliding into the shadows whenever he glanced back, careful to cover the glint of sword and revolver with her cloak. At last he came to a ramshackle building between heaps of old girders. He gave a rhythmic knock, the door swung open, and he went in. Talia clambered up one of the piles of girders and ran along the top until she was level with the building. Then she leapt the gap, landing deftly on the roof. From there, she lowered herself to a walkway running around the upper storey of the building. “Is that you, Jo?” someone said. Talia tensed. A woman stood a dozen paces away, a battered rifle in her hands. There was no time for bluffing. Talia lunged forward, getting her hand over the woman’s mouth before she could call out. As the rifle swung around, Talia snatched the pistol from her belt and slammed it against the lookout’s head. The woman’s eyes rolled and she slumped in Talia’s arms. Talia lowered her to the ground, bound her hands and feet, and gagged her. Then she found the nearest window and sat, listening to the conversation inside. “What do we do until then?” Pollyglog asked. The tavern door opened. A woman walked in with a bruise on her face and a battered rifle in her hand. Pollyglog had never climbed out of a privy window before. It was a good thing she was there to show him how. If you missed it, you can find the first part of this story here. If you’d like to receive the rest of the story straight to your inbox, as well as a free e-book, then please sign up for my mailing list. If you’ve enjoyed the story, please share it with your friends – that’s how I get more readers, and so can justify keeping on with this.